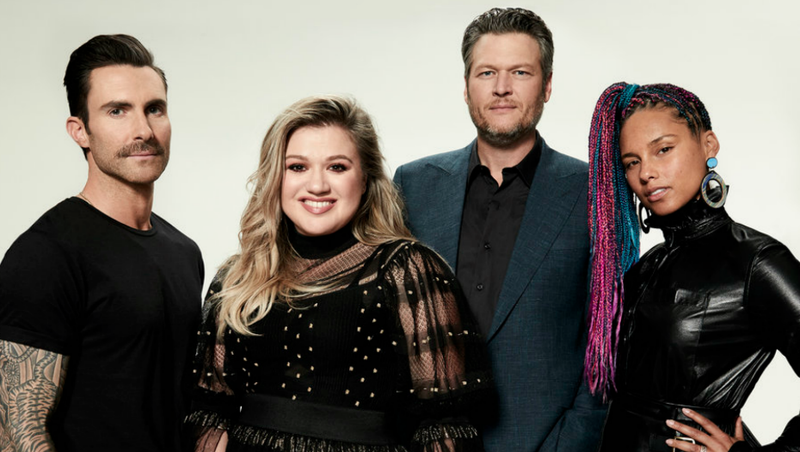 Season 14 of The Voice is here, and it’s going to be a season filled with energy and tough competition — thanks to the addition of Kelly Clarkson, who joins returning judges Blake Shelton, Adam Levine and Alicia Keys. Each of them has won at least one season, and they aren’t letting Clarkson forget it. She’s taking the ribbing in stride, though. She has a trick up her sleeve: winning Season 1 of American Idol. Clarkson knows what it’s like to be a contestant. To celebrate the return of NBC’s singing competition show, SheKnows got the inside scoop on what happens behind the scenes from executive producer Audrey Morrissey. 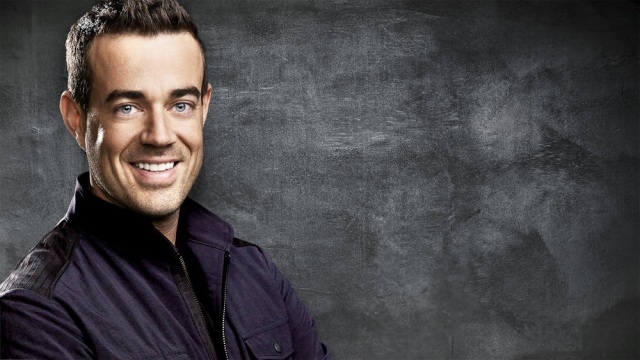 She answered our burning questions about the judge who maintains the most business relationships with the contestants to how Carson Daly manages a bicoastal schedule. 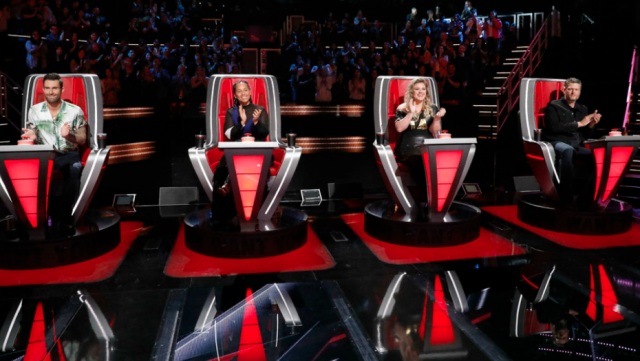 It’s every question you ever wanted answered about The Voice, and it’s just in time for the show’s first episode of Season 14. Even though The Voice doesn’t air the initial audition rounds, Morrissey said the audition process is quite extensive. “We scour the country visiting approximately six to eight cities twice a year for our auditions and hold both open call and appointment auditions,” she explained. Morrissey told SheKnows that the judges will listen to auditions “for five or six days with approximately 18 to 20 auditions per day.” However, the contestants do get a bit of a warm-up before they tape their audition. Contestants have to supply their own clothes for the blind auditions, but things get a little easier once they are attached to a team. Some minor modifications were made to the iconic red chairs a few seasons ago, but this season brings some big changes. The judges’ chairs have been completely redesigned to include three block buttons, in addition to the red button that turns the chair around. The block feature will allow a judge to block another judge from picking a contestant for their team during the Blind Auditions. This move can only be made once by each judge during this round. The contestants and their coaches are allowed to interact off-camera — but how often that happens is up to each coach. The contestants take much longer to prepare for the battle rounds than the actual taping takes. It’s a lot of buildup for a round that could end a contestant’s Voice run before it really gets started. “For battles, the coaching sessions take place over four days and the actual battle performances take two days,” explained Morrissey. Some coaches really want to create an overall look for their contestants, while other coaches prefer to keep it simple and let production handle the rest. Daly is a busy man when The Voice is in production because he also has his Today Show duties to tend to. Morrissey explained that during the prerecorded portions of the season, it’s easy to work out his schedule. However, it gets a bit trickier when they move to the live shows later in the season. “For the live shows, Carson does fly back and forth each week, spending Monday and Tuesday with us in LA and the rest of the week back in New York with the Today Show,” she said. Shelton has a great reputation for following up with contestants after the cameras stop rolling. He’s been rumored to continue his mentorship, to make a phone call or offer advice once the singers are out there in the real world. Morrissey didn’t confirm that rumor, but she did say he builds a strong relationship with his team members. Season 14 of The Voice kicks off on Monday at 8/7c on NBC. Don’t miss all of the action with Kelly Clarkson, Blake Shelton, Adam Levine and Alicia Keys.